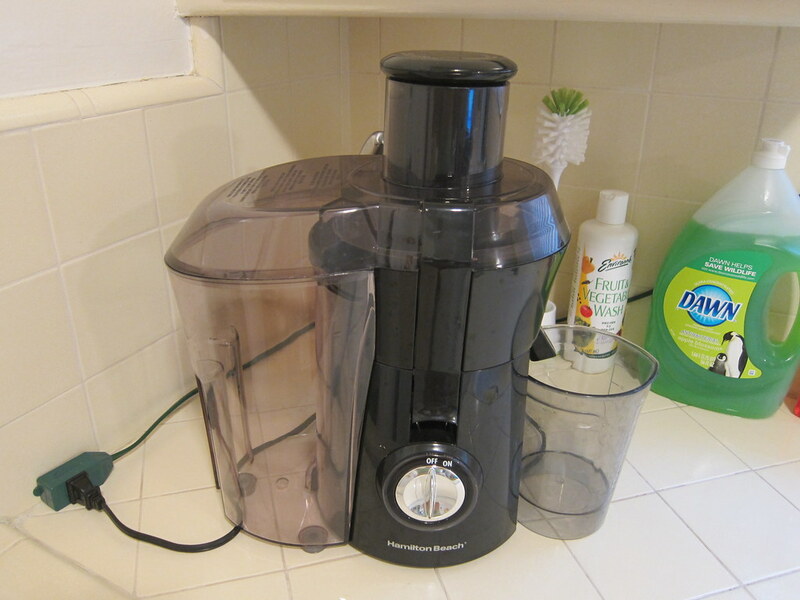 The Green Girl purchased a Hamilton Beach Big Mouth Pro Juice Extractor 67650 a couple of months ago to replace an older model Hamilton Beach juicer. 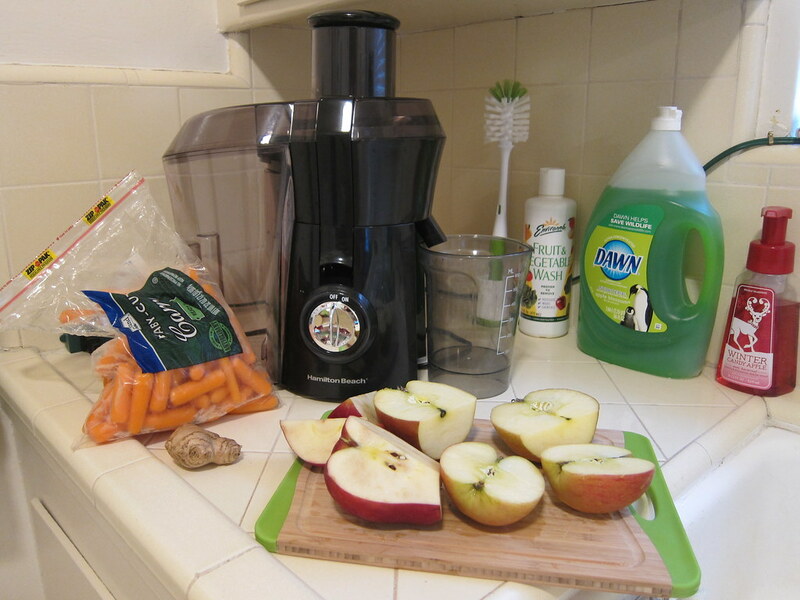 When I initially researched juicers, I was overwhelmed. The majority of consumers judged the appliances based on efficacy and ease of cleaning. 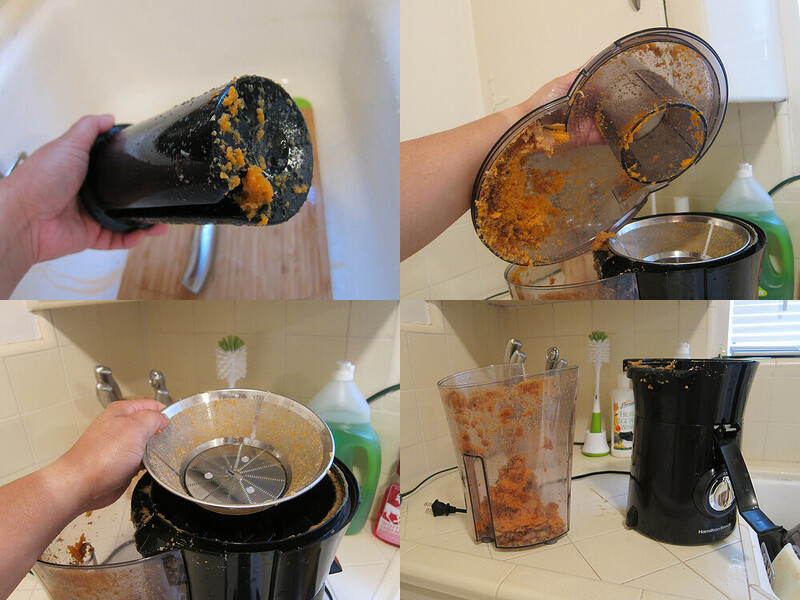 I discovered there are two types of juicers: masticating and centrifugal. Masticating juicers are more expensive and use a single gear or auger that breaks up the fruit and vegetable fibers, resulting in more fiber, enzymes, vitamins and trace minerals in the juice. Centrifugal juicers spin at high speeds, grind the fruits and vegetables, and then force the juice away from the pulp. 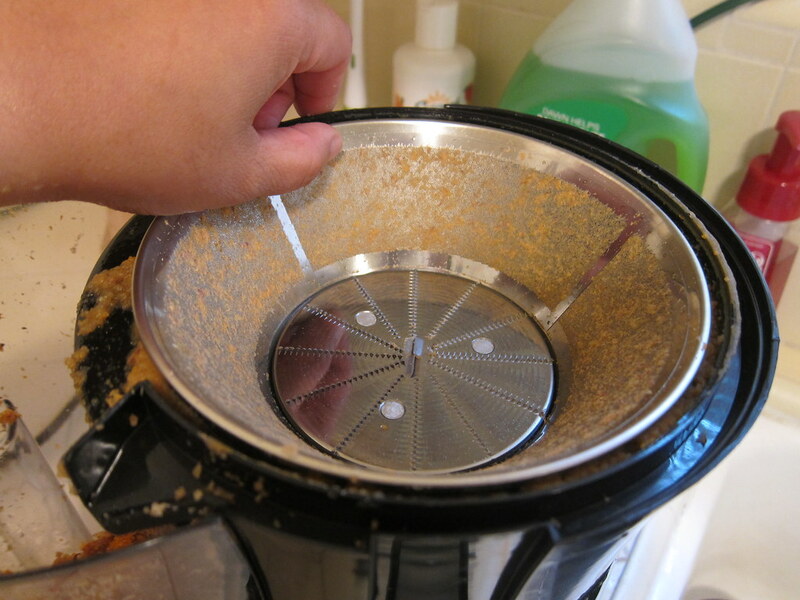 I ultimately purchased a Hamilton Beach juicer because I wasn't willing to make the financial investment in a masticating juicer. I got my first juicer at Kmart for $34.99. After 5 years or so, the blades became dull and the time came to replace the unit so without hesitation, I purchased the newest Hamilton Beach model. In comparison to my old 400 watt HealthSmart Juice Extractor, the 800 watt Big Mouth Pro Juice Extractor is a beast. I love the wider chute because I don't have to spend as much time chopping up fruits and vegetables. Disassembling the unit after use is straightforward. 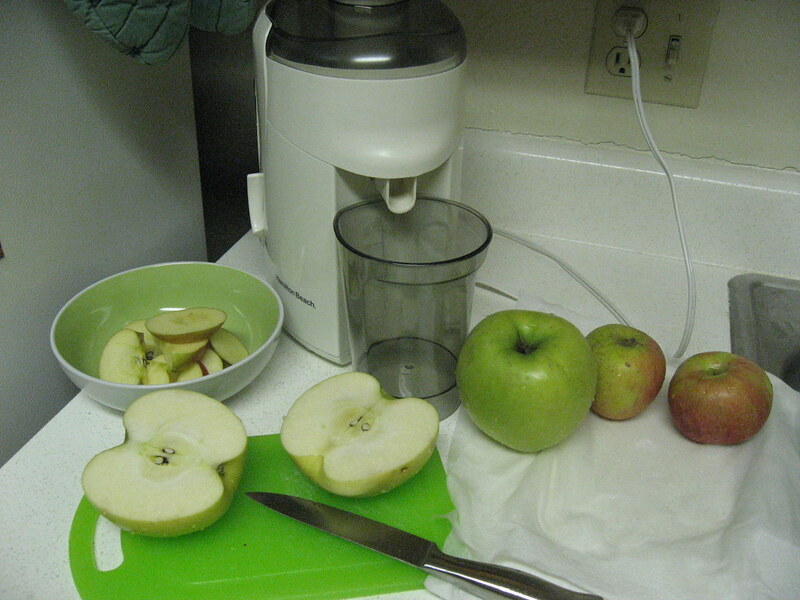 Since I tend to juice a few times a week, I've streamlined the process. The key is to washing the five pieces as soon as you are done so the pulp doesn't dry up and become difficult to remove. 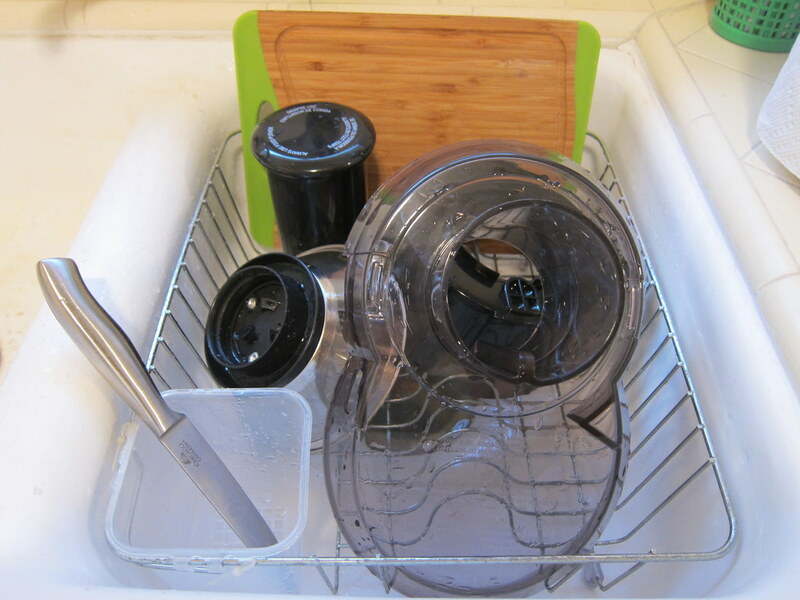 I immediately rinse each component under hot water, starting with the pusher and the chute cover. The cutter/strainer screen is tricky to remove because you need to pinch the rim and rotate it until it comes loose. I rinse it and then place it in the sink. Next, I rinse the separator with the juice sprout. I don't wash the bin until after I've deposited the pulp into my compost bin. 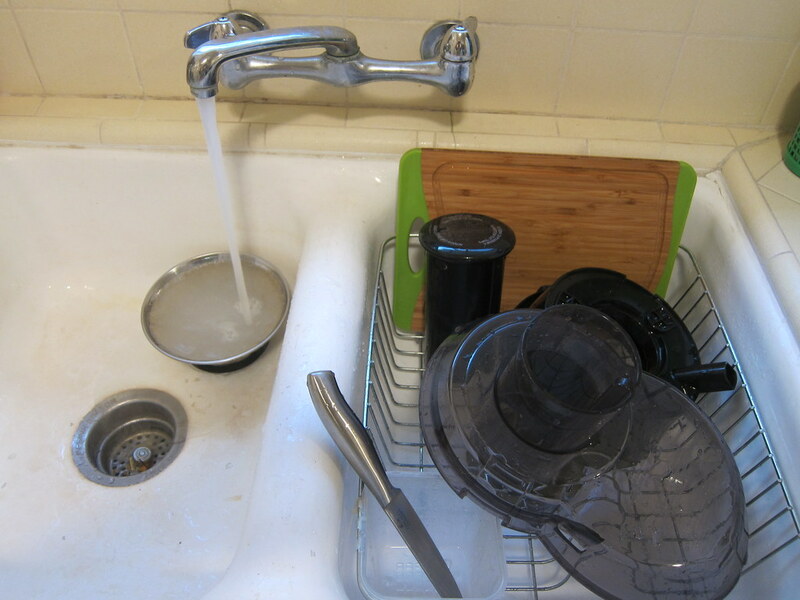 Once all the components have been rinsed, I wash them with dishsoap and a sponge. Since I've already rinsed with hot water, all the juice and pulp has already been removed. I always leave the cutter/strainer screen for last. I start by rubbing the inside of the round screen with the sponge, avoiding the blades in the center. Then, I rub the outside. Finally, I carefully use a corner of the sponge to remove any remaining bits of pulp. I've gotten to the point where I can wash the fruits and/or vegetables, chop, juice, and wash the juicer in about 15 minutes. I love being able to make fresh juices at home and experimenting with ingredients is a lot of fun. If you are on the market for an reasonably priced centrifugal juicers, I highly recommend the Hamilton Beach Big Mouth Pro Juice Extractor. The Green Girl's running coach, Steve Mackel, has been chosen to be an ambassador for the ING New York City Marathon ING Runner's Nation ING Class of 2012. The ING New York City Marathon ING Runner's Nation is a virtual community for runners. Coach Steve and three other running bloggers will be the official Hosts for the interactive ING Runner's Nation. The RNG Runner's Nation Hosts were chosen to represent the diversity of the running community. According to New York City Marathon officials, 50% of the marathon participants are from outside of the US. Coach Steve from SoCalRunning.com is the Coach. Monica from Run Eat Repeat is the Foodie. Dave from Run Like A Clydesdale is the Clydesdale. Jen from Mad Cool Fitness is the New York City Local. 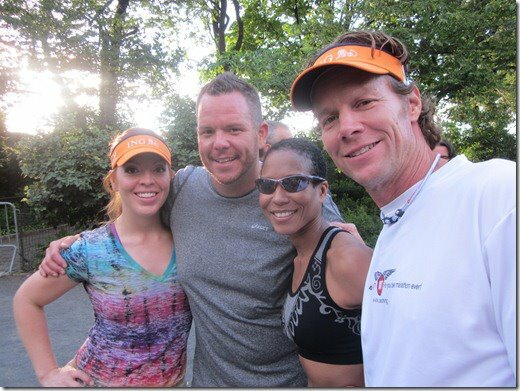 The running hosts recently spent three days in New York City filming footage for the ING Runner's Nation web series. Coach Steve will have the opportunity to share his some of his expertise and personal experiences through weekly webisodes. In addition to offering support and advice in the ING Runner's Nation forum, Coach Steve will also train 50 ING Runner's Nation runners virtually through his Sole Runners training program. Coach Steve is currently training for Mt. Baldy Run-to-the-Top, Malibu Triathlon, Berlin Marathon, Long Beach Marathon, and the ING New York City Marathon. If you see Coach Steve at any of these races, stop by and let him know you're a friend of The Running Green Girl. If you would like to join the ING Runner's Nation, simply 'Like' them on Facebook or 'Follow' them on Twitter using hashtags #ingclassof2012‬ ‪#ingnycm‬ ‪#ingnation‬. If you would like to follow Coach Steve, you may 'Friend' him on Facebook or 'Follow' him on Twitter.